Supporting blood cancer patients requires a global effort. Last year, over 1,000 Celgene employees, friends and families gathered together in cities across the country to honor people whose lives have been touched by blood cancer, by raising lanterns along with nearly $285,000 for the Leukemia & Lymphoma Society’s (LLS) annual Light The Night® campaign. 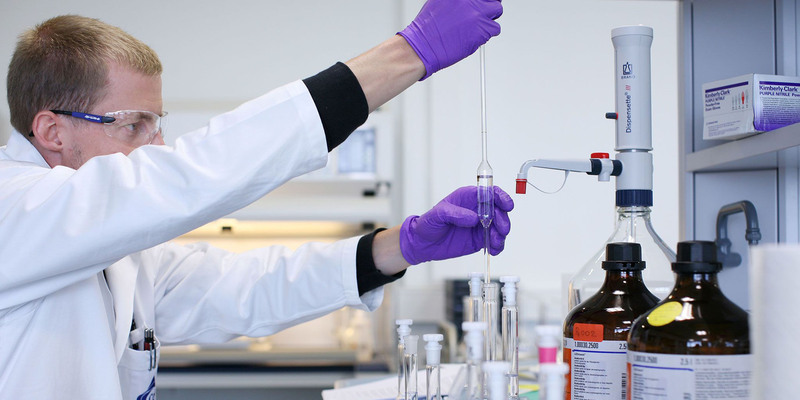 With that total, Celgene was named the top fundraising biopharmaceutical company in the United States. This level of contribution to the fight against blood cancer could not have been achieved without selfless teamwork from across the company. When the opportunity came earlier this year to lead those efforts, Kimmet jumped at it. The decision was personal to Kimmet, who lost a dear friend and colleague to leukemia last year. Kimmet joined Celgene in January, so this year’s walk in Summit, NJ will be his first. 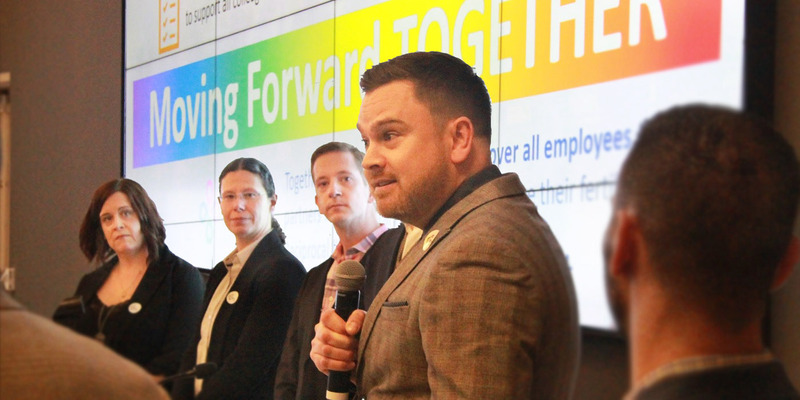 Already, he sees how the campaign is helping people with blood cancer and bringing together employees at Celgene. 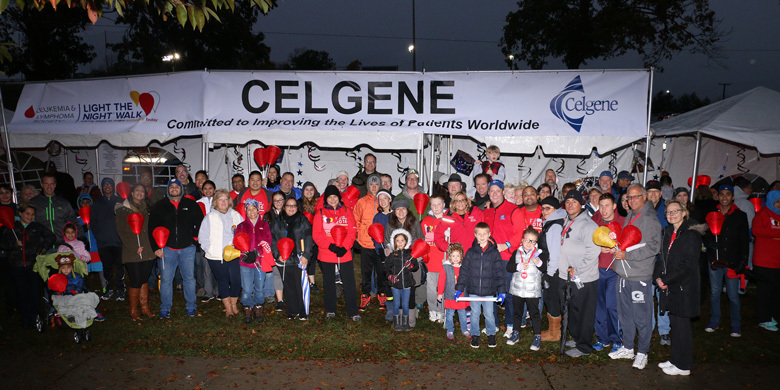 IN 2016, CELGENE EMPLOYEES AND THEIR FAMILIES AND FRIENDS PARTICIPATED AT THE LIGHT THE NIGHT WALK IN SUMMIT, NJ. One of Kimmet’s colleagues who has supported Celgene’s efforts for Light The Night across the country is Allison Handel. 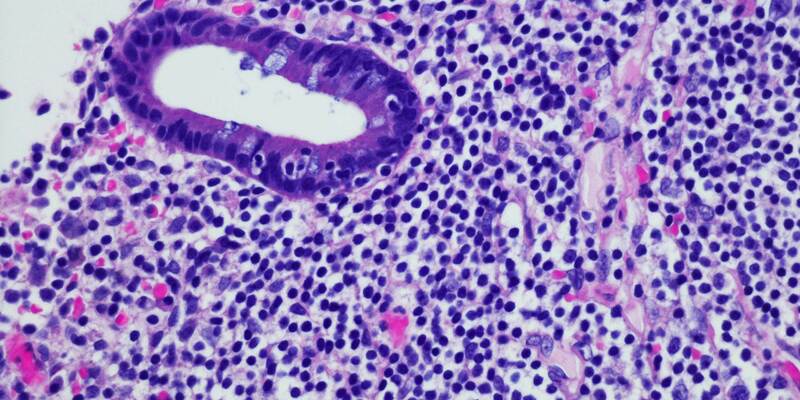 She lives in Arizona and manages Celgene’s corporate alliances in hematology and oncology. 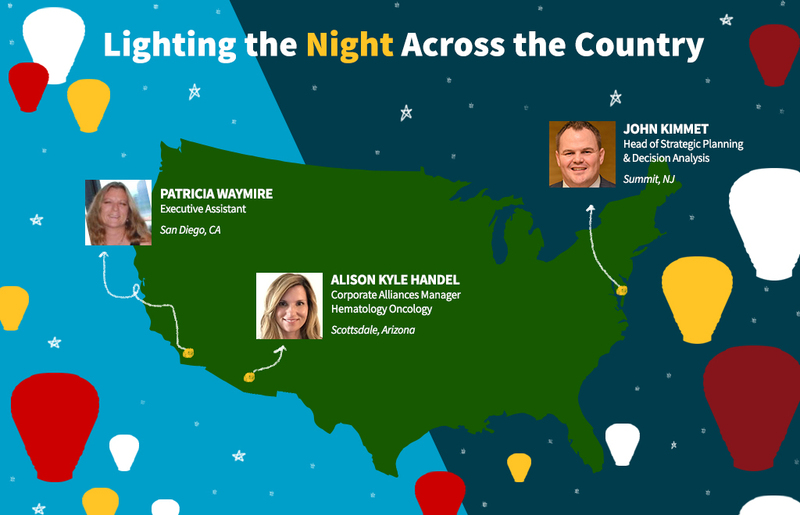 She has been driving campaign participation across the commercial sales team for the past six years, motivated by her experiences at her local Light The Night walks. She has become passionate about putting the “fun” back into fundraising for the LLS campaign, especially by organizing the sales team’s charity auction. CELGENE EMPLOYEES PLACED THEIR BIDS FOR ITEMS DONATED BY THEIR COLLEAGUES TO SUPPORT THE LIGHT THE NIGHT CAMPAIGN DURING THIS YEAR’S SILENT AUCTION. This year, 70 baskets were donated, and ten items were auctioned off live in front of over 500 attendees. Hot-ticket items included an espresso package from the Seattle team, a week-long stay at a luxury condo in Honduras from the Kansas City team, and a private batting practice experience with the New York Yankees from the Phoenix team. 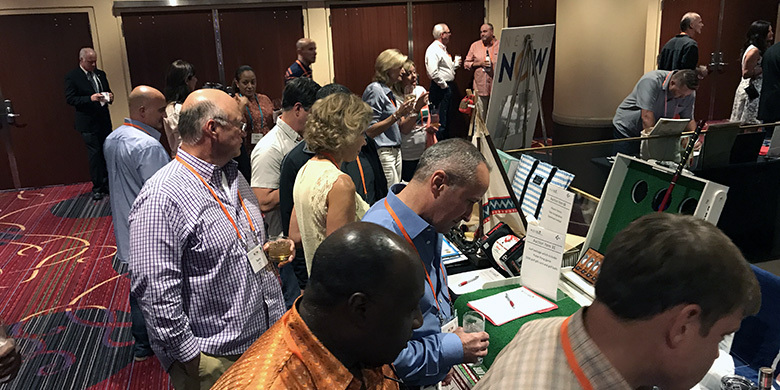 Each year, the silent auction continues to grow; this year’s event brought in about $70,000. 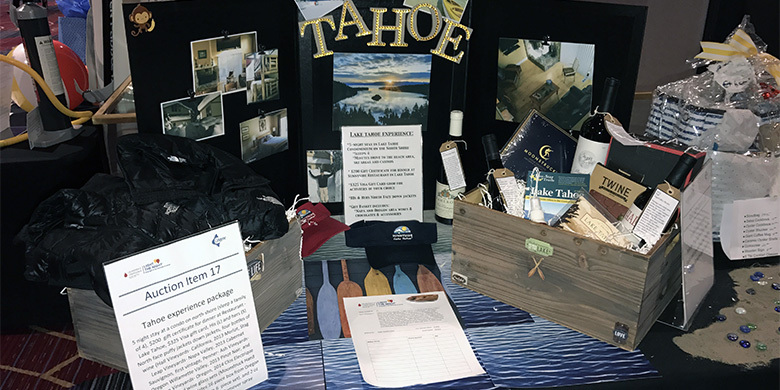 ONE OF THE ITEMS THAT WAS AUCTIONED OFF DURING THIS YEAR’S CELGENE SILENT AUCTION FOR LIGHT THE NIGHT WAS A LAKE TAHOE EXPERIENCE PACKAGE. Waymire grew her Celgene Light The Night team by making the campaign personal for her colleagues. 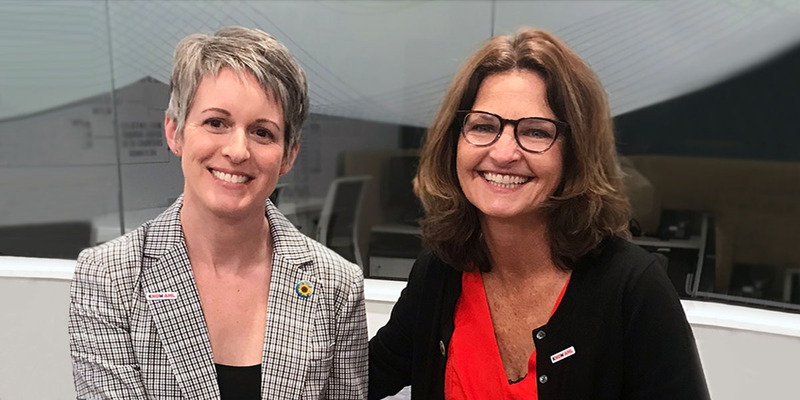 Since the San Diego facility comprises mainly research scientists who spend their time at the bench, not the bedside, Patty brings her teammates together for “Lunch and Learns” with LLS advocates and patients. There, employees can meet the people who benefit from their research and hear their stories directly. 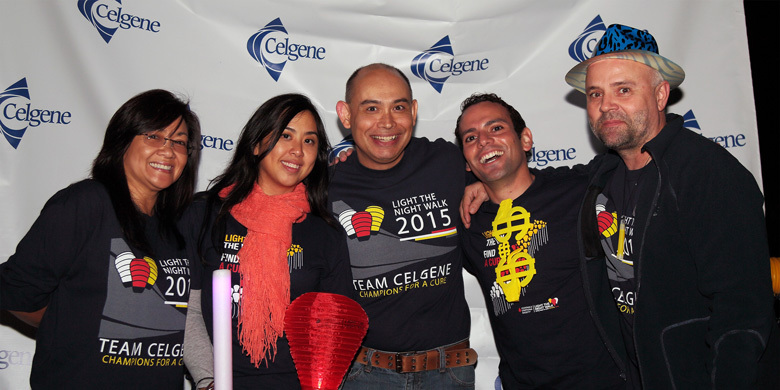 CELGENE TEAM MEMBERS FROM SAN DIEGO WALKED IN THE 2015 LIGHT THE NIGHT WALK TO RAISE FUNDS FOR BLOOD CANCER RESEARCH. Waymire believes that all her colleagues, regardless of location, get back as much as they give to the Light The Night campaign. And she’s thankful for the opportunity to lead her team in San Diego. To find a fundraising event near you or donate online today, visit the Light The Night® website.